Congratulations! Chi-Shuen Lee, an EE department student under the direction of GIPO professor Lung-Han Peng, wins the "2010 undergraduates' case study projects Research Creation Award". Congratulations! Jen-Tang Lu, a GIPO student under the direction of Prof. Chi-Kuang Sun, wins 2nd place in "2011 Youth Thesis Award, The Chinese Institute of Electrical Engineering". Congratulations! The GIPO students' team under the direction of Prof. Jr-Hau He, wins the "IUMRS International Conference in Asia Outstanding Paper Award (one paper) & Excellent Poster Award (two papers)". Congratulations! The GIPO students' team under the direction of Prof. Jr-Hau He, wins the "2011 SAMPE student thesis Ke-Young Award (outstanding)". Congratulations! 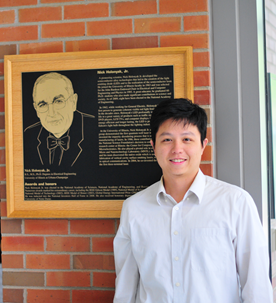 Hung-Chih Chang, a GIPO student under the direction of Prof. Jr-Hau He wins the "2011 Lam Research Award (excellent)". Prof. Roel Baets visited GIPO on July 11th (Monday) and spoke on the topics of: "Silicon photonics, the integration of light sources" and "Introduction to EMMP (future EMSP) program" at Auditorium 105, EE Building II. His speeches were exciting and well-considered in every respect, and he interacted well with the audience. GIPO professors and students participated in this event with enthusiasm and gained a great deal of knowledge from it. Hi, everyone! I'm this year’s new president of the GIPO students’ association, Chi-Fan Huang. I'm so happy to be able to have the opportunity to serve my GIPO classmates and teachers. First of all, I would like to thank Liang Liao, a doctoral student in Prof. Ding-Wei Huang's laboratory. Liang Liao was a member of NTU student association since he was an undergraduate student at NTU. 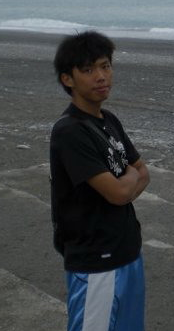 Therefore, he is experienced in organizing student events and is the best candidate for this term. However, due to a heavy study load, he did not take the position and recommended me instead. I appreciate Liang Liao's kindness and also the thorough support from my advisor - Prof. Way-Seen Wang, who’s positive and optimistic outlook in study and in life has taught me a great deal. GIPO is a large group. In order to win honor for NTU and Taiwan, everyone's very dedicated to his/her studies. However, this does cause many of us to neglect the people around us. It seems that there is not as much interaction between GIPO students as there was during our undergraduate years. I sincerely hope that, during my term, through the GIPO's social events and recreational activities, our classmates and teachers can be away from the equipments and research papers occasionally and interact more with each other. This way, everyone can make friends outside of his/her laboratory, improve the interpersonal relationships and reinforce his/her identity at GIPO. During the first semester, we are going to hold the traditional mid-autumn festival meal party again. In view of the fact that, on the once-a-year mid-autumn festival day, when the moon is full and most family members reunite, many GIPO teachers and students are still wrestling with work and studies, we would like to create a unique party and bring a happy mid-autumn festival to everyone in the GIPO. Please mark your calendar for the occasion, enjoy the meal, relax, and chat with the classmates. After the hearty meal, we will further invite you to participate in our mystery activity. In the second semester, we certainly will not miss the much-anticipated GIPO ball games. As usual, we will decide what kind of ball game we will have this year from a poll. We hope that, aside from the laboratory experiments and paper work, we can take good care of our own health. By participating in sports together with classmates, we can, at the same time, experience the importance of team work. Nevertheless, being graduate students, we are supposed to focus on our studies and don’t have as much time left for fun as most undergraduates do. Therefore, when we hold these events, we will try our best not to affect your study time. Please let us know if you have any concerns about these events. The role of the association is to encourage our students to develop better relationships with others, and, hopefully, to be the bridge between students and teachers. During the coming year, it is our hope that we can give you something special, something other than experiments or research papers, for you to remember your years as a graduate student. By the way, if you are passionate about the association's work and wish to create a unique graduate life, you are most welcome to join us. Please contact me as soon as you can. Thank you all! Taiwan's optoelectronics industry has recently developed vigorously, both in quality and quantity, and has become an indispensable part of the world. With the desire to sow and plant seeds, GIPO has held the summer camp every year to attract creative and prospective youth to join this field. Through exciting speeches, experiments and tours, participating students have learned with their hearts, done with their hands and seen with their own eyes. They certainly have gained a lot from the camp. Dr. Chia-Wei Sun, a researcher of the Biophotonics Interdisciplinary Research Center, National Yang-Ming University, delivered the first speech on the first day. Dr. Sun is also a distinguished GIPO alumnus. He studies methods of using optoelectronics techniques for early detection of serious inherited diseases, such as Parkinson's disease. 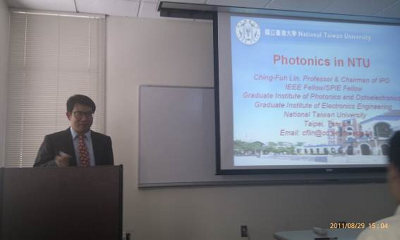 Next, Jian-Jang Huang, a GIPO professor specialized in solid-state lighting, spoke on "The development of Taiwan's solid-state lighting technology". The value of Taiwan's LED output has been placed within the world's top three. When LED goes from screens to lighting devices, what kind of advantage does Taiwan have and what kind of approach should the optoelectronics industry take? Prof. Huang answered students' questions incisively, increasing students’ belief that Taiwan's optoelectronics industry has unlimited potential. 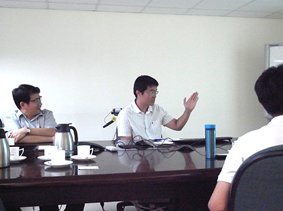 In the afternoon, Prof. Hoang-Yan Lin gave a lecture on the principles and processing procedures of the three experiments set up by GIPO. Then the students performed the hands-on experiments, which allowed them to better understand the principles shown in the textbooks and made a deeper impression, since they were learning and practicing at the same time. 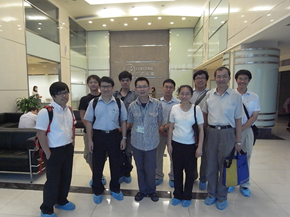 Afterward, we visited Prof. Lung-Han Peng's, Prof. Ching-Fuh Lin's and Prof. Chih-I Wu's laboratories. These laboratories cover the three major domains of optoelectronics - organic optoelectronics, inorganic solar cells, and solid-state lighting devices. Through interactions with laboratory researchers, the students realized that GIPO's study resources are abundant and the researchers are excellent. These certainly have inspired the students to apply for GIPO for their graduate study. The next morning, at 8 AM, while the temperature rose up to 33 degrees, we got together at NTU main gate and were ready to visit Hsinchu Science Park - the stronghold of Taiwan's optoelectronics industry. This time we visited two world-class manufacturers - Epistar Corporation and AU Optronics Corporation. Epistar is Taiwan's largest LED epitaxial grain manufacturer. It makes 80% of the world blue chips and 60% of the world red chips. AUO is one of the world's three largest display panel manufacturers. It has complete production lines for large, medium and small panels. After having a tour in Epistar's clean room and offices, we went to the conference room to hear the superintendent's briefing and an experience-sharing report from an Epistar's employee, who is a GIPO alumnus. To my surprise, after the briefing, the students talked with the superintendent for one hour, showing that they were very interested in the employment opportunities of optoelectronics graduates. 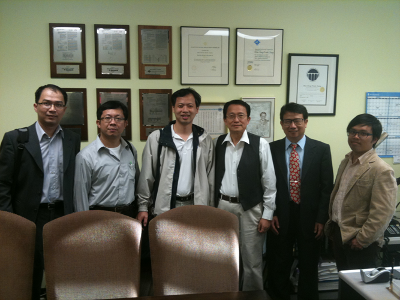 At AUO, we were received by the director of the human resource department personally. Then, the OLED superintendent briefed us the AUO's strategy in OLED display panel. To our astonishment, we then realized that AUO had a whole set of recreational facilities and its gym occupied a whole building, which made us long for working in such a corporation. We went back to NTU when the night came, and we all felt that it was a worthwhile trip. In the early morning of the 3rd day, Prof. Jui-che Tsai delivered a speech on "the application of MEMS devices in fiber optic communication". Next, Prof. Ding-Wei Huang delivered a wonderful speech concerning "the general situation of the development of optical communication". As human information transmission quantity grows bigger and bigger, optical communication has played a very important part, and it is also the focus of GIPO's development. Next, Prof. I-Chun Cheng delivered a speech concerning "the general situation of the GIPO's development in solar cells". Due to energy crisis, solar cell technology has developed quickly in recent years, and Prof. Cheng is one of the leading experts in this field. 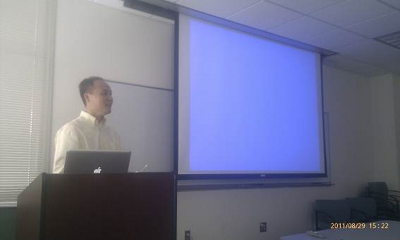 Last, Prof. Hoang-Yan Lin delivered a speech concerning "the development of display technology and its industry". Display technology is not just a semi-conductor industry, but, due to its involvement with human vision, a more complicated design technique. Prof. Lin's speech made students realized that there is much experience and knowledge hidden behind the colorful monitors. After the speeches, Prof. Ching-Fuh Lin, the chairman of GIPO, awarded the students with certificates and held a forum with them. The chairman made us understand the current status of optoelectronics industry easily. He analyzed in detail what Taiwan's advantages in this field were and how GIPO ranked in the world's study. Then, he summarized the three days' lessons by giving us an overview in energy, communication, display, biomedicine and lighting. From his introduction, we realized that GIPO's published periodical papers had not only kept pace with world's famous universities, but were even transcending them. I'm delighted to have the opportunity to be involved in this year's optoelectronics summer camp, which gives me a sense of duty to pass down our traditions. It's the professors, who delivered the speeches, and the students, who helped to interpret the experiments, who made this camp versatile and remarkable. We would like to thank Li-Chi from the GIPO office for her time and hard work in organizing this event. Also, thank you to the students, Chi-Hsing, Yu-Feng, Li-Chuan, Tsung-Min and Prof. Hoang-Yan Lin's laboratory's research team, who volunteered to help. And, of course, we have to thank the chairman for his kind support towards this camp, which has made everything possible. Epistar Corporation is located in Hsinchu Science Park, specialized in producing HB-LED, epitaxial chip and grain. And, it does so using its own MOVPE technique to develop HB-LED series. Epistar's manager, Aisen Liu, received us personally, and Ming-Hsun Hsieh, the vice general manager of the PR center, and his crew held a research-technique-exchange seminar with us. The professors briefed the crew on their field of research and specialties, and then discussed the possibility of cooperation with them. Afterward, Hsueh-Shun Wang, deputy manager of Epistar, accompanied us to inspect their transferable research instruments. This visit concluded smoothly after that. It is our hope that we can establish a long-term research cooperation relationship with Epitstar through this interaction and visit. Frankly speaking, this is not the 1st time I visited UCLA. Ten years ago, when I was studying in the USA, a classmate of mine, studying in UCLA, showed me around the campus for an entire afternoon. In addition, GIPO has 2 excellent UCLA alumni as well. Therefore, I have been quite impressed with their outstanding research. However, until this summer, I have not yet had the opportunity to interact with the EE department professors' laboratories of UCLA. 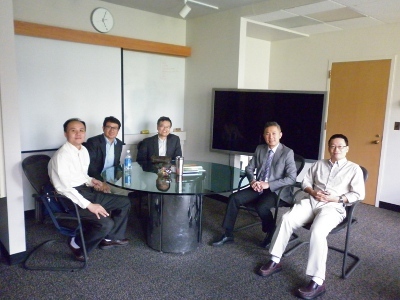 In the early morning of August 19, under the lead of chairman Ching-Fuh Lin, we, Prof. Chih-I Wu,Yuh-Renn Wu, Jr-Hau He and myself, five in all, went to the UCLA Engineering IV Bldg. Originally, we thought we were going to report our studies in turn and discuss with UCLA professors. Much to our surprise, UCLA EE was so attentive as to make this visit a seminar with snacks and beverages, even though the visit occurred during summer vacation. About 10 professors and twenty-some graduate students took time from their busy schedules to attend this event. First of all, Prof. Chang, the head of UCLA EE department, reported their profile. They have many academicians of the National Academy of Engineering, and, of course, many fellows of several associations. These scholars have written many textbooks which we read frequently, and have made several breakthroughs which have affected modern technology and our lives. It was an excellent report, and UCLA deserves to be one of the America's top universities. Next, Prof. Bahram Jalali delivered a speech on "Evolution of photonic time stretch: from analog to digital conversion to blood screening". Prof. Jalali is a famous scholar in optics. He has made breakthroughs in photonic time stretch, and has applied it to blood screening. Moreover, I personally feel that, perhaps because of the prompt from their funding agency or the emergence of some topics in related fields, UCLA's optoelectronics research may have certain connections with bio. For example, Prof. Eric Chiou's speech "Photothermal nanoblade for single cell surgery and cargo delivery" and, Prof. Ozcan's student, Ting-Wei Su's speech "Lensfree on-chip microscopy for global health applications" all have integrated MEMS and optical lens' design with bio. Next, Mr. Scofield delivered " Nanopillar-based photonic crystal lasers: a bottom-up approach to photonic integration". 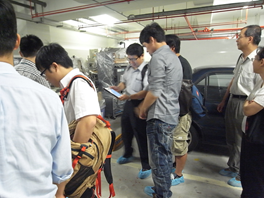 We visited the laboratories in the afternoon. Among them, Calif. Nanosys Inst. (CNSI) is worth mentioning. Despite the fact that UCLA has already been a first-class distinguished university, CNSI is still working hard to invest in creativity stimulation and in the top-notch research of the next generation. Perhaps it is only my opinion, but, in comparison, NTU is still revolving around some KPI, and takes excessive seriousness in numbers, such as paper numbers, citation numbers and ranking numbers. This visit has refreshed my thinking. We would like to thank Mau-Chung Chang, UCLA EE department head, for his banquet in the evening. Besides his distinguished research in RF, Dr. Chang is also very cultivated in speaking. He chats charmingly with us, and we all had a wonderful time. From our conversations, I have also learned how to invest in real estate: the price of the housing in the areas by mountains, rivers or seas, the limited supply of land will rise more easily. After attending the SPIE meeting, GIPO professors took the opportunity to visit the nearby UCSB. The main purposes of visiting UCSB were to reach a bilateral cooperation and interaction agreement, to exchange education viewpoints concerning double degrees, and to reach some research cooperation alliance agreement. As we know, UCSB is not a traditional Ivy League university; however, in recent placings, it is rising fast, especially in materials and electronics engineering. Particularly, after the establishment of California NanoSystems Institute (CNSI) and the emergence of several Nobel Prize winners or prospective winners, UCSB's fame is increasing. It is now a key university famous for science and technology. Among the departments, the material department has risen the fastest; it is currently ranked No.1 in the U.S. It makes people wonder: how did UCSB rise so quickly? Since I had the privilege of being subsidized by the National Science Council and NTU to study here as a visiting scholar since this September, I took the responsibility to contact and consult with the related people concerning this visit. In the early morning of a clear day, I drove a friend's car to pick up chairman Ching-Fuh Lin and Prof. Guo-Dung Su and headed to UCSB EE department. With the help of student Lin, we met Prof. Cheng, the ex-head of EE, without any difficulties, and exchanged viewpoints concerning both sides' research topics. Because they had been good friends, and it was Prof. Cheng who helped to prompt this visit, the talk was lively and animated. Next, we went to visit Prof. John Bower. 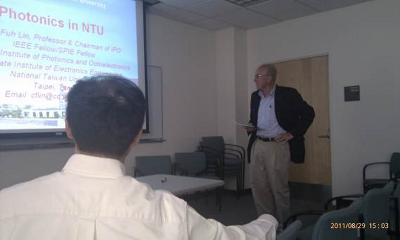 Since Prof. Bower had cooperated with GIPO Prof. Chi-Kuang Sun before, he received us most cordially. 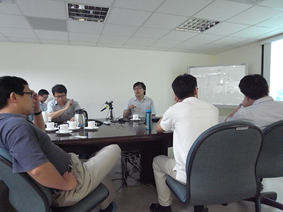 The chairman shared with him the newest achievements of our ring waveguide study. Afterward, we went to visit Prof. Bower’s laboratory. At 11 o'clock, we went to visit Prof. Larry Coldren, the dean of the College of Engineering. We talked about the researching topics and double degrees from the two universities. With a new dean, who had not arrived at UCSB yet, coming to take his post in early September, any conclusion had to left until that time. At noon, the dean invited EE's ex-head Prof. Cheng, the material department's ex-head Prof. James Speck and us to have lunch at a nearby beach restaurant. We talked about how to promote the departments' reputation during the meal. It was admirable that their professors were still trying hard to promote UCSB's fame when it had risen so quickly already. Prof. James Speck was also an important person responsible for operations at the solid-state lighting center. He talked with us about the possibility of forging a cooperative alliance and invited our chairman to a discussion concerning cooperation details with Prof. Steven DenBaars, the head of UCSB solid-state lighting center, before we leave UCSB. This was a great breakthrough for our visit. The afternoon's schedule was mainly visiting laboratories. Around 3 o'clock, chairman Lin briefed UCSB students and professors on GIPO's present situation. 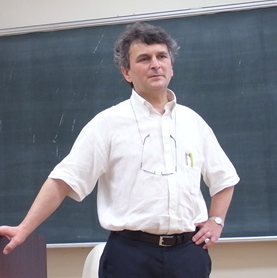 Afterward, Prof. Su reported GIPO's achievements in laboratory experiments. I didn't make any report since my stay here would be more long-term and Prof. James Speck had made arrangements for me to report in October. In laboratory visits, Jordan and Christopher, Prof. James Speck's students, led us to see their crystal growth facilities. We were a bit envious when we saw the amount of equipments they had. We were especially impressed by their professional FAB management crew. For example, UCSB had over 10 sets of MBE facilities and several sets of MOCVD facilities which could be shared together. Its professional management crew kept the clean room equipments in good condition - any breakdown would last no more than 2 days, close to industry standards. I believed that this is a good point for us to learn. To improve our research capability, we have to offer better working environment and maintain a good management crew so our researchers can concentrate on research instead of worrying about the equipments' problems. UCSB's clean room is exceptionally large and open to the public. Because of its advanced facilities, several small companies use the clean room facilities to develope new processes and technologies. Clean room access charges from the companies are enough to cover the research expenses. In addition, the efficient management and income from the charges enables UCSB to renew clean room facilities and attract more business. We heard that there were over 10 companies that were willing to pay more than half a million dollars each year to access it, which accounted for the up-to-date equipment and stability of these facilities. I believed that this is one of the reasons why the ranking of UCSB's College of Engineering and the Material Department, in particular, had risen so fast these years. In the evening, chairman Lin went to talk with Prof. James Speck and Prof. Steven DenBaars about the details regarding the visit, and student Lin led me and Prof. Su to visit the laboratory of Prof. Heeger, a Nobel Prize winner. We talked with his students about the laboratory's style and characteristics, which impressed us greatly. This visit was short, but we had gained a lot from it. I will stay at UCSB for two semesters and will gain a greater understanding of UCSB's facilities and structures. In the coming year, I hope to interact more with Prof. James Speck's laboratory and build the bridge between GIPO and UCSB, so as to make some big breakthroughs in research and gain positive exposure for NTU. Cornell University, established in 1865, located in Ithaca, New York state, is one of the Ivy League schools and the only one which was established after the independence war. It has an agreement with New York State to co-manage three undergraduate colleges and a graduate veterinary hospital. It is funded by the state government to support some specific research. State residents studying in Cornell are eligible for certain tuition discounts. Thus, students in certain departments pay a tuition that is similar to that of public schools even though Cornell is a private institution. The Ithaca campus holds the Humanities College, Engineering College, Agriculture College, laboratories and physical education buildings. There are Gothic, Victorian and new classical style buildings around the Humanities College. And many famous buildings are located here as well, such as Statler Hotel, the teaching hotel of Hotel Management College. Aside from having the No. 1 American Hotel Management College, Cornell's Engineering Science, Agriculture Engineering, Literature Theory, Architecture, Chemistry, Biology, Quantum Physics, Computer Engineering, Communication Engineering, Aviation and Space Engineering, Manufacturing Engineering, Mechanical Engineering and Civil Engineering are all placed within the American top 10s. These departments cover comprehensive study fields; therefore, Cornell is a large one among the Ivy League Universities. We visited the School of Electrical and Computer Engineering this time. Once entering the Duffield Hall, it is hard not to notice those names on the desks and chairs, which are the names of their alumni who donated these chairs/desks. Having realized that, we cannot keep ourselves from admiring the fundraising abilities of American private schools. 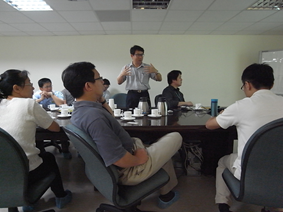 With the help of Prof. Tsuhan Chen and Prof. Edwin Kan, we were able to talk with a few professors face to face. Aside from introducing each other's research, we also gained a better idea of possibilities for future cooperation. GIPO could send doctoral students to study in Cornell, and attract their students to study in NTU as well. These are positive steps towards our cooperation and the promotion of internationalization. Due to the assistance of Hotel Management College, Cornell's room and board is considered one of America's best, which enables students to enjoy their study years here. At the end of this visit, their department head, Prof. Tsuhan Chen, invited us to dine at Statler Hotel to enjoy its Italian gourmet food and Cornell's beautiful sunset, ending the visit perfectly. There have been many Chinese Cornell alumni. The most famous are Teng-Hui Lee, former president of Taiwan, and Shih Hu, a littérateur. I would recommend students to experience their life in Cornell if they have the opportunity. Chao-Hsin Wu received the B.S. degree in Electrical Engineering and M.S. degree in Graduate Institute of Photonics and Optoelectronics from National Taiwan University, Taipei, Taiwan, in 2002 and 2004, respectively. He used to work as a full-time teaching assistant in charge of Automatic Control Lab in the Department of Electrical Engineering in National Taiwan University from 2005 to 2006. He then joined the High-Speed Integrated Circuit group in University of Illinois at Urbana-Champaign in 2006 and received the Ph.D. degree in 2010. After finishing the Ph.D. degree, he continued working as a postdoctoral research fellow before he joined the faculty member in National Taiwan University in 2011. His research topics focus on the design, fabrication, and characterization of high-speed III-V semiconductor electronic and optoelectronic devices, including heterojunction bipolar transistors, field-effect transistors, and microcavity lasers. The main interest is developing the novel device, the light emitting transistor (LET) and transistor laser (TL), which is a three-port device with simultaneous electrical and optical output. 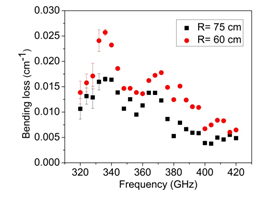 The device demonstrates a fast-recombining carrier lifetime (in picosec range) than conventional LEDs or diode lasers, resulting in a resonance-free laser response and 7 GHz spontaneous modulation bandwidth (world record). It can help reduce the cost, complexity, and heat problem of current communication system. The "transistor-like" building block is suitable for next-generation photonic integrated circuit (PIC) application. During his leisure time, he enjoys traveling around and taking pictures. He also likes to go to gym or play badminton to get some sweat. He encourages students to develop some long-term habits during their graduate life, and find out what they really want in the future and start to prepare for it at this moment. NTU has lot of resources, but most important is that we are surrounded by many talented people. Students should take the opportunity to learn as much as they can, and they don’t want to leave here with nothing but a piece of paper. Take challenges and do the best! Sub-wavelength optical wires fabricated using CMOS (Complementary Metal–Oxide–Semiconductor) compatible techniques will lead the way to feasible and economic integration of optics and electronics. However, on the CMOS transistor layer, which necessitates thermal conduction through the silicon substrate, the SiO2 layer is very thin, so having more than a few hundred nanometers of SiO2 underneath the Si waveguide creates incompatibility. In addition, CMOS circuits are usually built on regular Si wafers instead of o called SOI (silicon on insulator) wafers. Here, we investigate a novel method to fabricate Si/SiO2 waveguides from a regular silicon wafer rather than SOI wafer. It allows the archtect of great flexibility in design and fully compatible with the CMOS circuitry. As shown in Fig. 1, deep silicon ridges were firstly created using typical lithography and dry-etching process. Then, high-power excimer laser was used to illuminate the Si ridges. Under proper illuminating condition, the Si ridges would be melted and reshaped to circular-profile structure. Finally, high-temperature oxidation process was used to oxidize the reformed structure. The final oxidation of the neck of this reformed structure prevents optical loss due to light coupling from the waveguide to the substrate. A structure with a uniform round cross section was formed. It exhibits a Si core with a diameter of 400 nm. 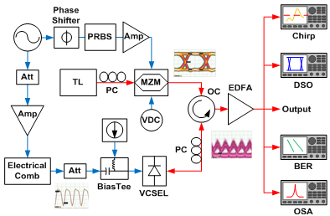 The result shows the potential of integrating electronics and photonics on a single chip. Fig. 1 SEM images of fabricating Si waveguides (a) a Si ridge from a regular Si wafer; (b) a circular structure after laser reformation; (c) the structure after first oxidation and removing the oxide; (d) the structure after second oxidation. The ultra-broadband nature of transition-metal-doped materials is eminently suitable for applications, such as petabit-bandwidth telecommunications and cellular-resolution optical coherence tomography. Various Cr4+:Y3Al5O12 (Cr4+:YAG) lasers in bulk-crystal forms have been realized, yet poor thermal loading was identified as one of the key factors currently limiting the laser performance. This renders bulk forms difficult to implement as efficient, compact, and affordable laser systems. Recently, a double-clad architecture grown by the codrawing laser-heated pedestal growth (CDLHPG) technique was successfully developed for broadband light source and amplifier applications. The fiber based waveguide geometry features a high pump intensity and a better heat dissipation, resulting in a low-threshold Cr4+:YAG laser. We report a significant advancement in the performance of a compact, efficient, low-threshold, and continuous-wave (CW) Cr4+:YAG double-clad crystal fiber (DCF) laser grown by the CDLHPG technique. To our knowledge the optical-to-optical slope efficiency of 33.9% is the highest ever reported for Cr4+:YAG laser at room temperature (RT) with just air cooling. This efficiency improvement was achieved by incorporating a strain-free Cr4+:YAG DCF. The strain-free feature also mitigates the photobleaching effect in Cr4+:YAG. 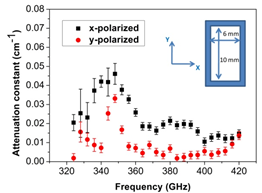 Additionally, a self-selected linear polarized output (>100:1) was attained by simply adopting the orientated Cr4+:YAG gain medium without introducing any intracavity polarization-dependent components. 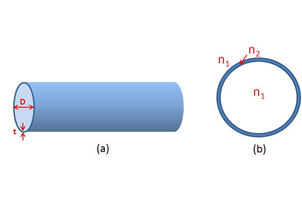 The impact of crystal orientation on laser polarization and the slight pump-induced laser depolarization are also addressed. 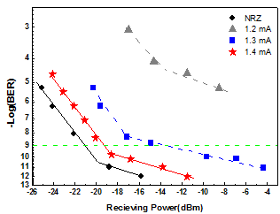 Figure 1 shows the CW RT Cr4+:YAG DCF laser output power versus the incident pump power. 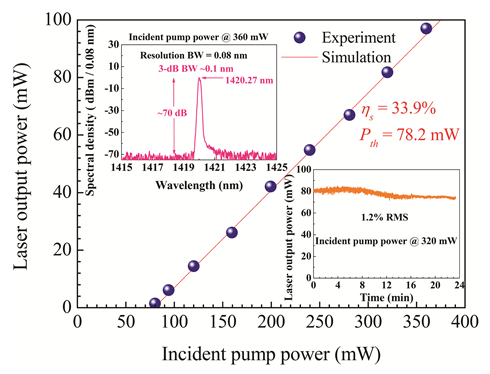 The lasing threshold Pth was 78.2 mW with an optical-to-optical slope efficiency ηs up to 33.9%. The laser was operated at RT by just air cooling. The laser performance agrees well with the four-level Cr4+:YAG DCF model. By taking advantage of the strain-released crystalline core, the extracted best-fit values of emission cross section and fluorescence lifetime were improved significantly compared to that of strained core. In conclusion, a Cr4+:YAG DCF laser with a 33.9% optical-to-optical slope efficiency and a 78.2-mW threshold is demonstrated. This achievement was obtained by reducing the distorted Cr4+ tetrahedron via strain relief and photobleaching mitigation. Realization of low-threshold lasing with high slope efficiency at RT for broadband gain medium at near infrared wavelength range represents a major step towards an affordable, compact, and efficient active device for applications ranging from telecommunications to biomedical applications. Fig. 1. Cr4+:YAG DCF laser output power against the incident pump power achieved at RT. Upper inset: the corresponding lasing spectrum at the maximum incident pump power of 360 mW, showing a high side-mode suppression ratio of ~70 dB. Lower inset: stability of the Cr4+:YAG DCF laser measured every 100 ms without active cooling at RT. Fig. 3. Bending loss spectra of the pipe waveguide for bending radius of curvature (R) = 75 and 60 cm. Fig. 4. 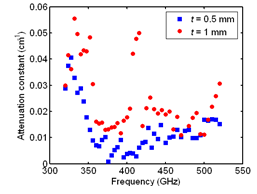 Attenuation spectra of PE rectangular pipe waveguides for different polarizations. Fig. 2. BER analysis of the optical NRZ from a externally modulated VCSEL without injection (black), and the generated RZ at 10 Gbit/s from the injection-locked VCSEL at DC bias of 1.2, 1.3, and 1.4 mA.